This project is finally finished after having restarted it several times. I am really happy with the result though so it was worth persevering! 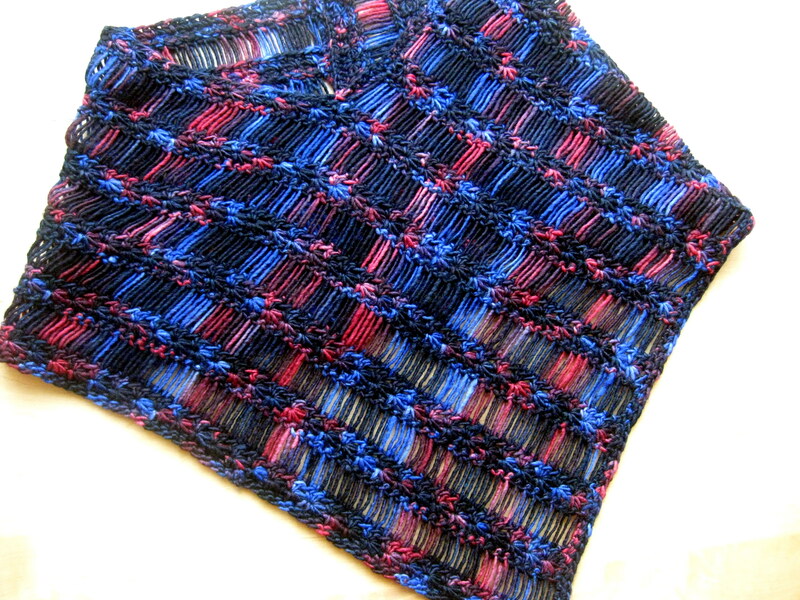 The final pattern is actually very simple and quick to work up thanks to rows of broomstick lace. I am in love with this beautiful yarn which I treated myself to back in September. It is a lovely merino wool and silk blend. I have been thinking carefully about what to use it for because I really wanted to show off the pretty variegation in the colours. I love how the star stitch displays the colours and I also felt that the yarn would look good if I could show off lengths of it so decided to include rows of broomstick lace. 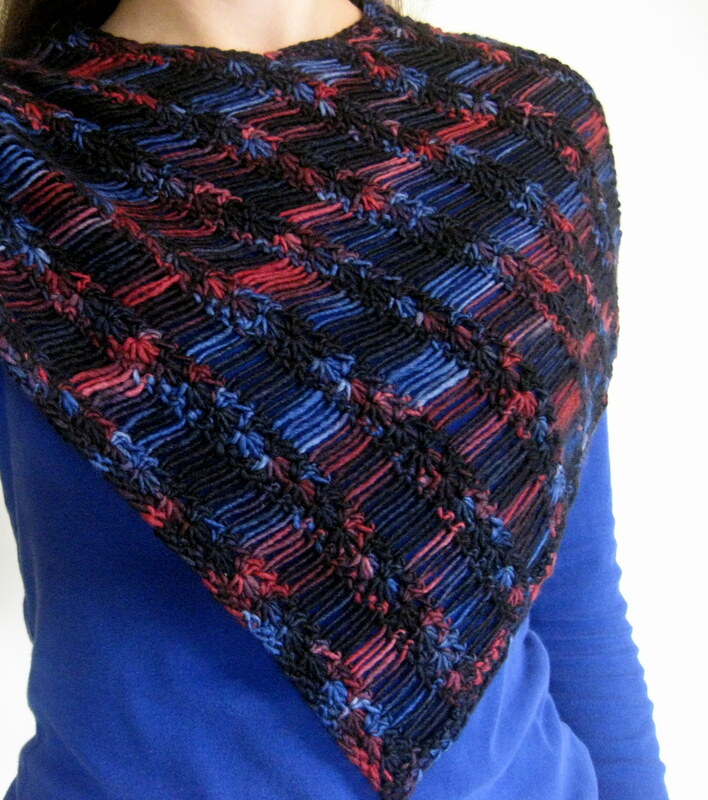 I think the lines of broomstick lace look like the trails of shooting stars, hence the name of this project! I’m really happy that this came out large enough to wear as a cowl or draped over the shoulders (more like a poncho) for extra warmth. Scroll down for both the US and UK pdfs of this pattern! Chain 1 to close the star (1 loop on hook). This forms the “eye” of the star. 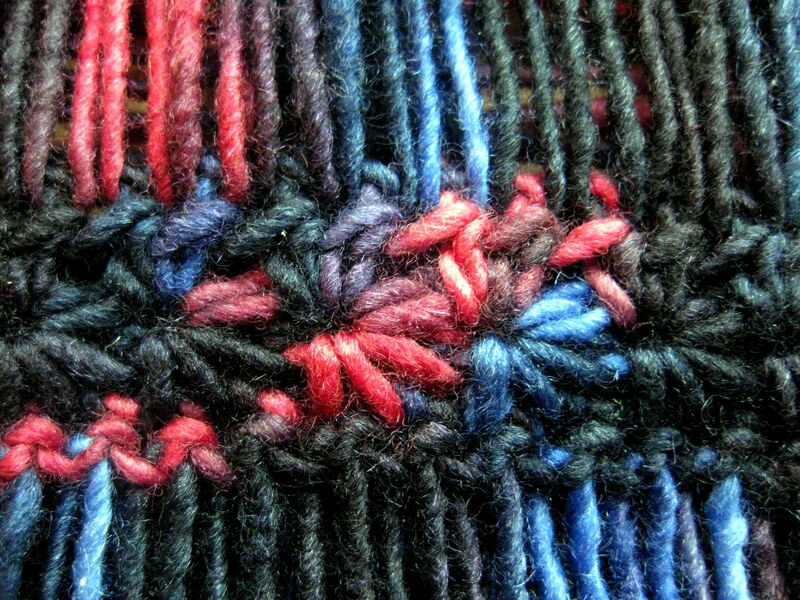 Broomstick lace is a technique whereby loops are drawn up through each stitch along the row. Each loop is place onto a broomstick handle, or large knitting needle, or in my case, a ruler. This makes all the loops the same length. 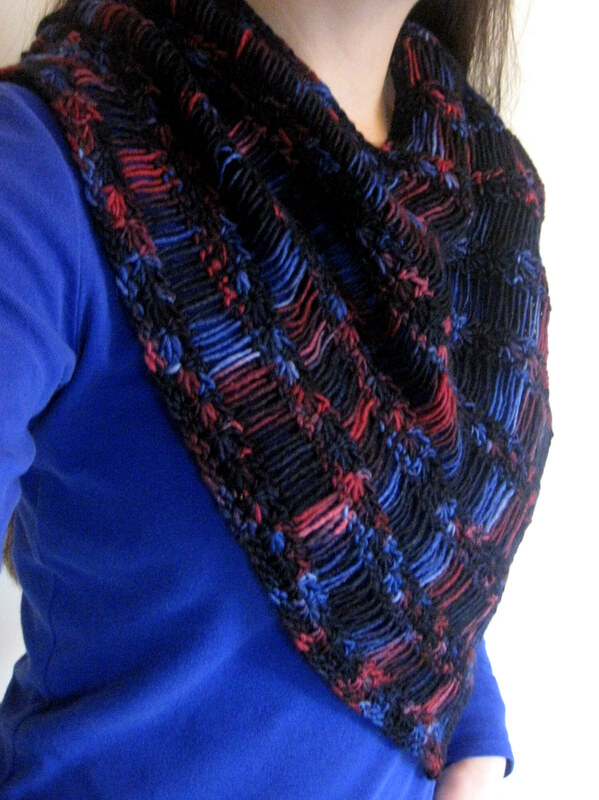 In this scarf, the loops are worked off one at a time and a single crochet worked in each one to make the “trails” of the stars. This piece is worked back and forth in rows to make an “L” shape. The ends of the “L” are then stitched together to make a cowl where the corner of the “L” makes the downward triangular point of the cowl. Chain2 at the end of a row counts as an hdc throughout. Ch3 is used to set up the star sts of the next row. R5: Slide the first loop off the ruler being careful to keep it the same size. Insert hook and yarn over, draw up a loop and ch1. *Slide the next loop off, insert hook through loop and make an sc. Repeat from * to end (88sts) and ch3, turn. Repeat rows 2-5 four more times, then repeat row 2-3. This is the end of the first section. TIP: Depending on your gauge you may want to work more or less repeats of the first section, or you may need to work more or less loops at the start of the 2nd section to make sure that each side of the “L” mirrors the other – work an even number of loops. Repeat these rows until the length of this side measures the same as the first side. You should end up with an “L” shaped piece which resembles a square with a square cut out of one corner. End on a row 3. Do not fasten off! Ch1 and turn to work a row of sc down the side of the work (this adds structure to the edge of the broomstick lace rows). I worked 3sc into each pair of star rows and 4sc into each edge strand of broomstick lace. Ch1, turn, and work a second row of sc back along this work. Fasten off and join to the opposite corner and work a row of sc down the other side (towards the inner corner of the work). At the inner corner sl-st into the 1st unwork st and turn to work back a second row of sc. Fasten off and attach to the corner of the other end and work a row of sc so that you have the same number of sc as the other side (40 plus 4 sts if you stuck with this exact pattern). Now block out your work. Blocking makes the rows of lace super straight and gives drape so I really recommend it! 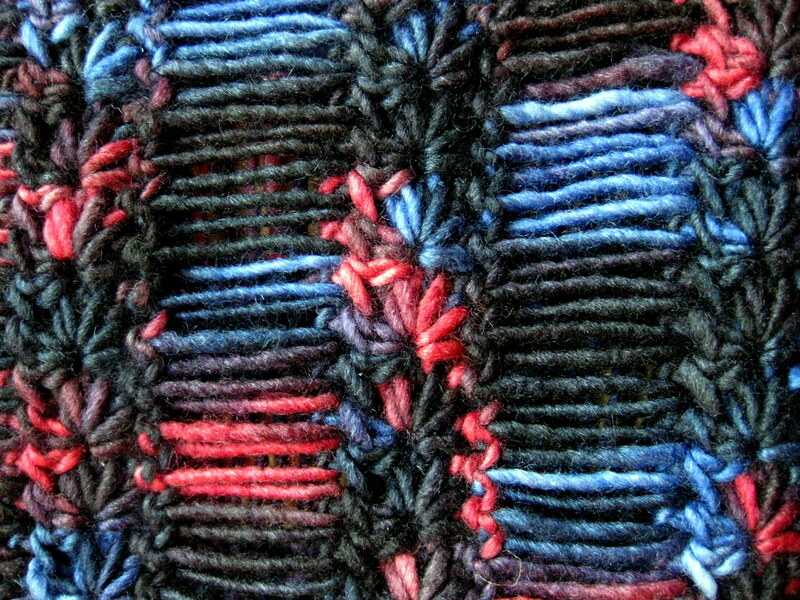 To finish, sc the ends together (or whip stitch if you prefer) on the inside of the cowl. Weave in any ends. very nice, and it does look like shooting stars! Absolutely lovely, this gorgeous yarn will keep you snug and warm in the winter chills. It’s gorgeous! The design decisions you made really do show off the yarn! That is gorgeous! Loving on the yarn!!! This is stunning and I’m trying to figure our how you started this. There doesn’t seem to be any # of chains to start, just ‘Fsc 87’ . Is this ‘single crotchet in the front loop 87 stitches’, then how many chains to start? I didn’t see this. I’ve been crocheting for 35 years all kinds of various things so I am fairly experienced. Also-I don’t have that brand or kind of yarn where I live. Is there any brand that would be similar or maybe I can find something similar if I knew the length of each color before it changes? Hi Laurie! “fsc” is foundation single crochet. I suggest you look at youtube for a tutorial if you haven’t come accross this before as there are plenty of good ones out there! Alternatively you can chain 88 and then work 87 single crochet into it, but then your edge won’t be as nice and stretchy. I’ve no idea what yarns are available to your locality I’m afraid but this seems to be working well with most kinds of variegated yarn (see the projects page on Ravelry to see what others have made! ).